As part of our pumpkin unit study, we made our very first pumpkin themed lapbook. 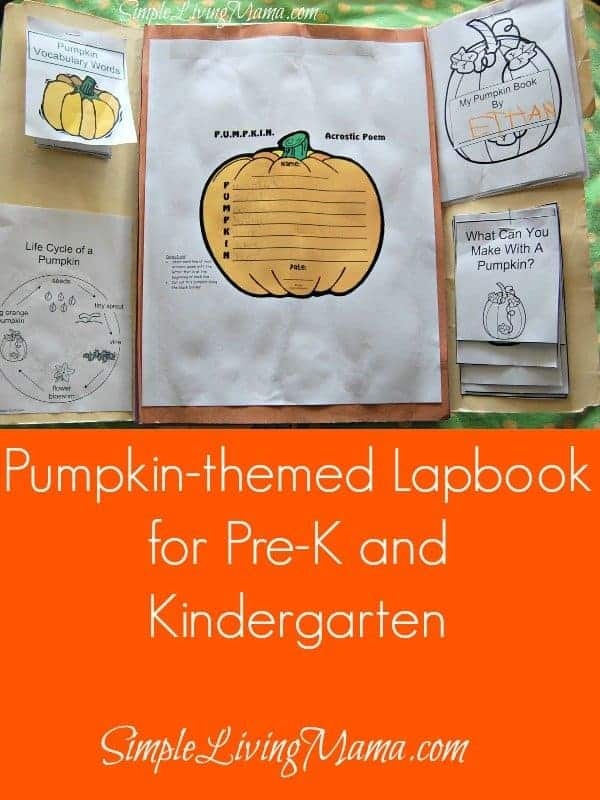 Not only was it our first pumpkin lapbook, but it was our first lapbook ever! 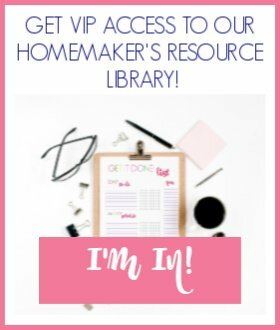 I learned a lot about assembling lapbooks, and I think my kids had a lot of fun learning with this lapbook. We look forward to doing this again in our homeschool preschool! 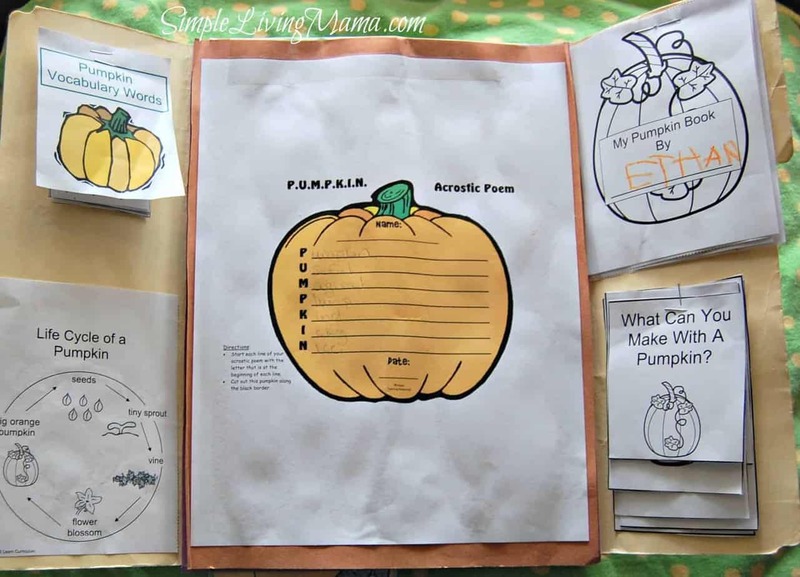 I want to show you everything we used for our pumpkin themed lapbook. This lapbook is geared toward preschoolers and kindergartners. This is the front of our pumpkin lapbook. I used a regular file folder and did the traditional trifold to make this simple lapbook. Almost all of the printables we used for this lapbook are the Fun with Pumpkins printables from 123learncurriculum.com. 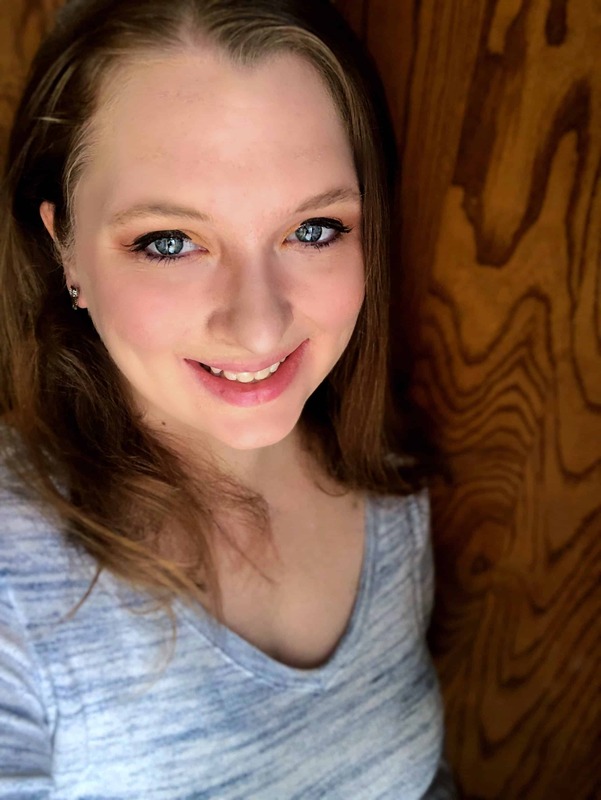 She shows you exactly how to set up the lapbook, which I did not look at that until after I started assembling my lapbook or I would have done it a little differently! On the left inside flap we have our pumpkin vocabulary words that I have Bug practice writing on lined paper. Down below we have the pumpkin life cycle that we discussed together. The right inside flap holds My Pumpkin Book that Bug can read to me, as well as a list of cards with everything you can make with a pumpkin. The first page in the middle is our pumpkin acrostic poem. I just had the kids help me come up with words to describe pumpkins. It was kind of hard! The next page was the Five Little Pumpkins poem. 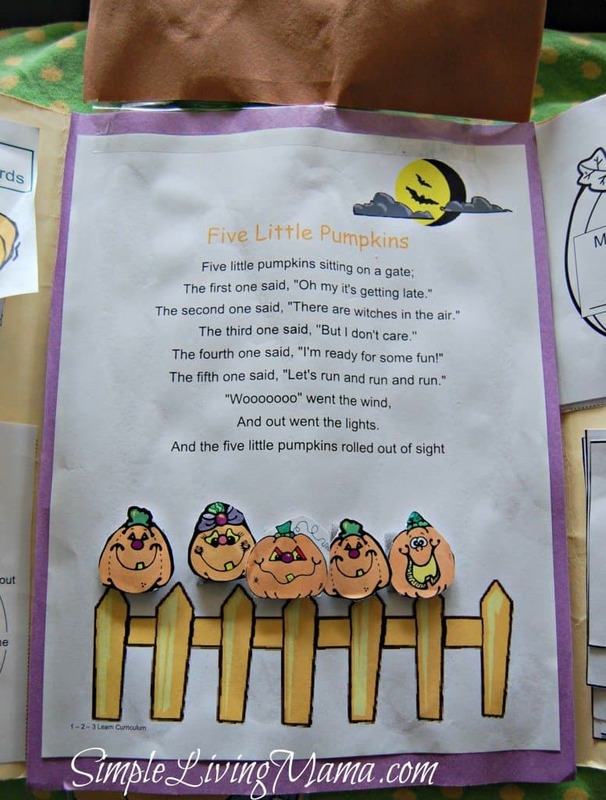 This was cute and the kids can place the pumpkins on the gate while they say the poem. The pumpkins are attached with velcro. 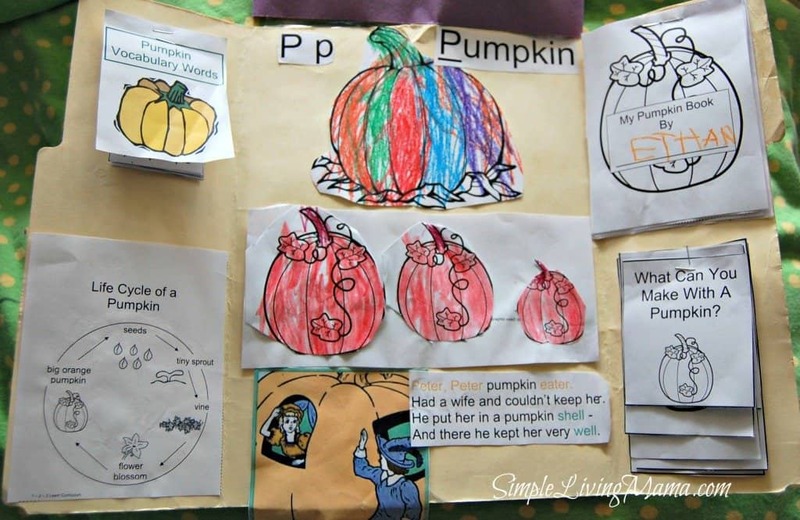 The final “page” inside the lapbook holds our Peter, Peter Pumpkin Eater poem, as well as pumpkins arranged smallest to largest and the letter Pp and Pumpkin. The back of the lapbook has a page for pumpkin word syllable counting. 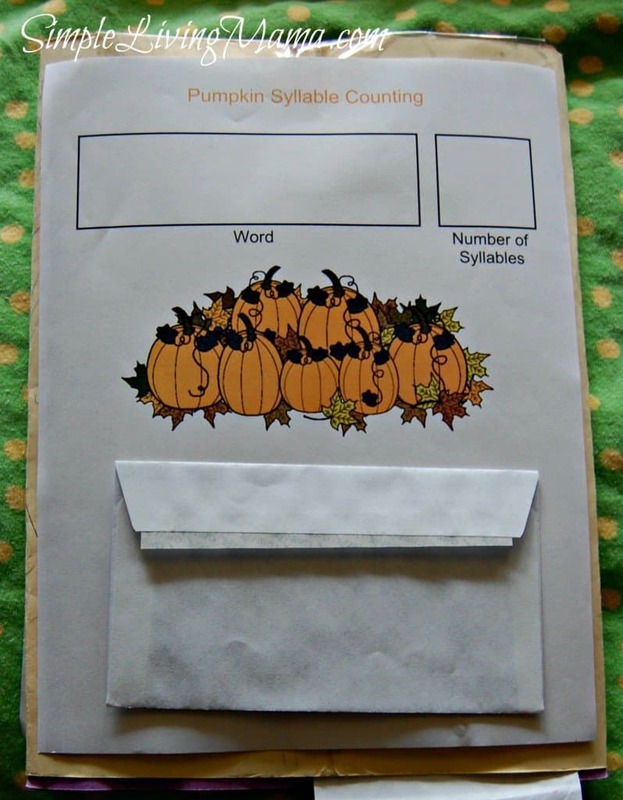 We haven’t done this one yet, but the kids just place a word from the envelope into the box and then put the pumpkin with the correct number of syllables next to it. 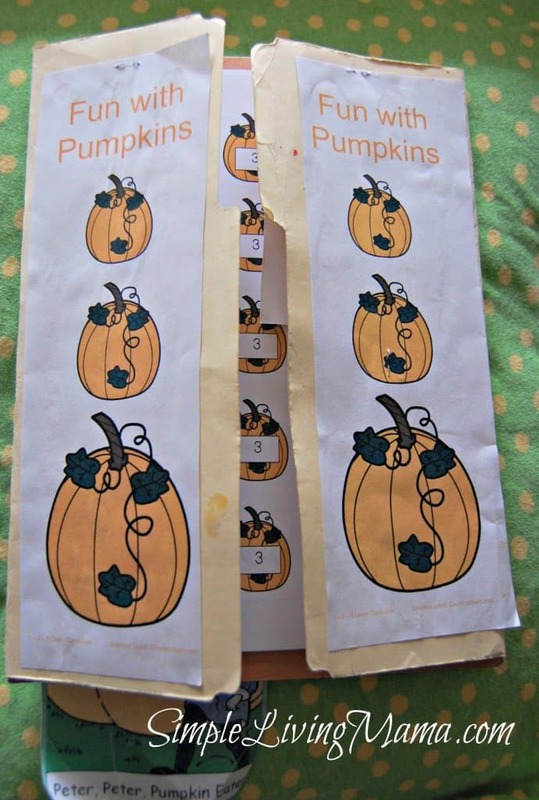 So, that was our little pumpkin-themed lapbook. I look forward to doing more of these for my kids. I think they reinforce everything we have been learning and they are fun to put together!